Ding dong, the barn is done! Sure enough, it's nothing more than a roof on stilts. But it's a roof that should last decades. We have all sorts of plans for completing it, but the hard part is finished and this roof will now offer protection for the 750 bales of hay which have been sitting out in the fields for the last three weeks. Yesterday morning, the first thing the builders did was start unrolling tar paper on the roof. Fortunately it was a touch cooler yesterday. The last week has been brutally hot here in north Idaho -- mid 90s, which is unusual and tough to handle since no one is used to heat. It was like working in an oven for these poor guys. Once the OSB sheathing was covered with paper, they covered the ridgeline. Then it was time for the metal roofing. Metal is the preferred roofing material in these parts because it sheds snow loads so beautifully. We had not seen many metal roofs until we moved to north Idaho, but it took only one winter for us to become absolute fans of this material. Piece by piece, they hauled those metal sheets up to the roof and screwed them down. Thankfully it wasn't a windy day because that would have made the task exponentially more difficult. After both sides were roofed, they put on the ridgecap. After the metal roofing and ridgecap were on, I wondered what was left to do. But what the builders did next impressed me: they bolted the roof trusses to the uprights with massive bolts. 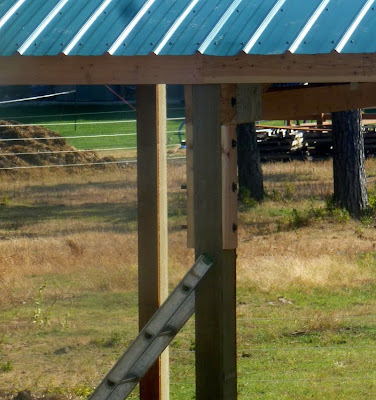 We get frequent high winds in our area -- 70 mph isn't all that uncommon -- so having this kind of shear strength is wonderful, especially once we increase the surface area of the barn by putting up siding. And that was it -- the barn is done! Now came the boring task of cleaning up. They used the little Bobcat to level the dirt pad and fill the holes where the concrete was poured around the uprights. ...and departed amidst a blizzard of thanks for all their hard work. This morning we have a load of gravel being delivered first thing. This will gravel half the barn floor (we'll have another load delivered later in the day). We have an all-hands-on-deck neighborhood workparty today. We hired three of the neighbor kids -- strong, strapping teenage boys -- to help us move hay. The weather is starting to change and we need to get those 750 bales of hay under cover or we'll lose the crop. Thank the good Lord above, we have a barn! Thanks for sharing this experience. It is amazing-I can't believe two men were able to do it by themselves. Congratulations on seeing some of your dream come true! Congratulations Lewis Family! I share your Joy! It is a beautiful process of life, to have a hard earned goal become fruition before your eyes! May you have many more successes on the landscape of the Lewis Farm. God Bless you and yours and all you put your hands to. Congratulations! It is so nice just to stand and stare at such a beautiful structure. (Not that you have time to stand and stare.) It will be nice to have that hay protected. That is so exciting! I am so happy for you. A new barn is such a wonderful thing. Can you tell I am a country girl, too? We chose metal roofing for not only our barn, but also our house, 15 years ago, and have never once regretted this choice. Love it! Congrats! If we were a bit closer we would come help with the hay. Sounds like you have a good work party though. Time for a harvest season barn dance and hoe-down at the Lewis homestead? Fascinating to see this barn raising. What a great addition to your farm.